As the nights draw in, what better way to banish winter chills than with a warming drink. In the last of her Christmas blog posts, Mary-Anne Boermanns offers something from our historical recipe manuscripts that will see you through the Christmas festivities and into the New Year. Originating in the Middle East, saloop was made from the ground roots of the Orchis mascula, the early-purple orchid. The plant got its name from the roots, which resemble testicles in size and shape and consequently saloop became synonymous with strength and robustness. Saloop was made by mixing the powdered root usually with water, but occasionally milk, and then heated, whereupon it thickened into a soup-like consistency. With almost no flavour of its own, it was made palatable by adding sugar and spices, with an occasional dash of spirits. Recipes are few and far between, with only a handful occurring in print in the 18th century. Nevertheless, a handwritten family recipe can be found in one of the early 18th century manuscripts. 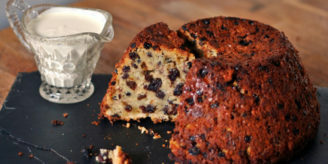 Dorothea Repps recorded the recipe below in her recipe book. Saloop recipe from “Dorothea Repp’s 1703” recipe book. Wellome Library reference: MS 7788. According to the 18th century physician and author Thomas Percival “Salep is said to contain the greatest quantity of vegetable nourishment in the smallest bulk” He declared it to be an admiral foodstuff for long sea voyages, not only providing a non-perishable source of nourishment, but also, should freshwater supplies run out, it could be mixed with sea water and not taste salty. Saloop stalls were a popular sight on the streets on London. Early in the morning the stalls were frequented both by chimney sweeps wanting to start the day with a nourishing drink and by late-night revellers wishing to stave off the effects of over-indulgence. “Saloop” by Thomas Rowlandson, 1820. 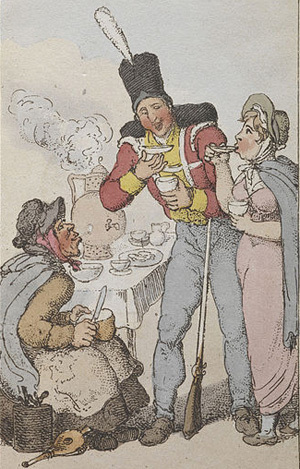 Taken from ‘Characteristic Sketches of the Lower Orders’ by Rowlandson. Image credit: British Library, London. Saloop’s reputation as a restorative became somewhat tarnished when it was rumoured to be an effective remedy for venereal disease. Frequenting public saloop stalls was thus seen as rather shameful and it’s popularity waned to such an extent that by the 1860s, it had been replaced by the more expensive coffee stalls. It is possible that supply problems also contributed to its decline, for although the countryside around Oxford produced the best English saloop, most was imported from the Middle East. Posset originated as a restorative for the unwell, but it wasn’t long before it was being enjoyed by the hale and hearty. A hot posset might be offered to visitors either upon arrival, to banish chills and imbue them with festive cheer, or at evening’s end before they departed into the frosty night. Nowadays, the term posset is used in reference to a cream dessert, flavoured with lemon and served cold, occasionally with biscuits with which to scoop it up. But a 17th century posset was a much more robust affair. 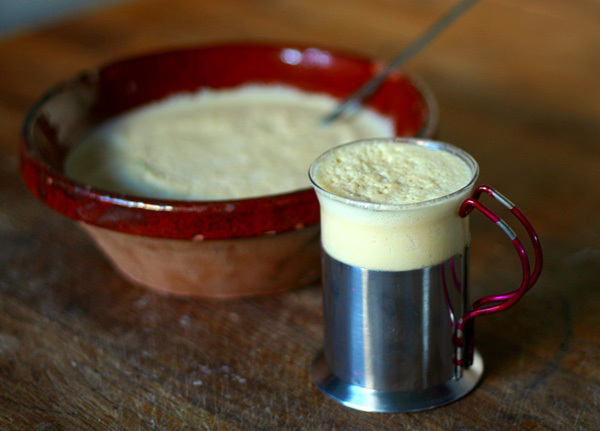 It is probably best described as a hot, cooked version of a syllabub: an invigorating quantity of alcohol, cream and sugar, heated and enriched by the addition of eggs. 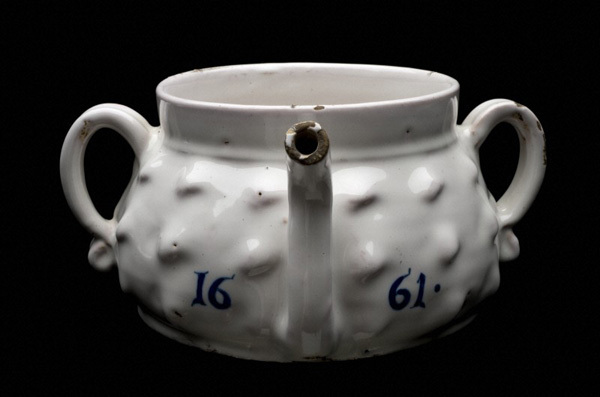 Posset pot, London, England, c. 1661. Image credit: Science Museum, London. Wellcome Images reference: L0057146. Possets could be made with many different types of alcohol either singly or as a mixture. 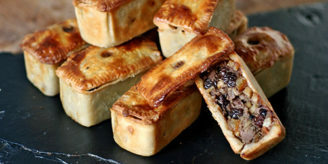 Popular choices were wine, ale, beer and cider, although going by the sheer number of recipes, the tipple of choice was sack, a fortified wine similar to today’s sherry. The style of the finished posset could also vary, from being a rich, custard texture under a froth of bubbles, to a triple-layered dessert of frothed cream over curds to be eaten with a spoon, while at the bottom a layer of hot, sweetend alcohol was sipped through the spout of specially designed posset pots. Custard posset. Image credit: Mary-Anne Boermanns. Put the milk in a pan with sugar to your taste and a grating of fresh nutmeg if liked. Meanwhile, whisk together the egg, yolks and sherry. When the milk is hot, whisk the eggs briskly as you pour over the milk. Return the mixture to the pan and heat through until thickened, whisking all the time. Do not let the mixture boil, or it will curdle. Enjoy warm with a further grating of nutmeg.